With some help from Wikipedia, I found that the image posted by Joe was from a volcanic field in western Sudan. So here comes WoGE #62. Compared to the Peruvian meanders, this should be easy. Extra points for knowing the story that this place is a good example of — there is a specific journal article I am thinking about. Schott rule in effect (post time 8:22 pm CST, 10-17-07). Black represents sand, gray is predominantly muddy deposits, and the white arrow at the river mouth shows the direction of longshore drift. oh yes…Danube River delta on the western side of the Black Sea! !I’m not sure which article you are thinking of, but the Danube is a great example of an asymmetric wave-dominated delta. Note the difference between two sides of main river channel. 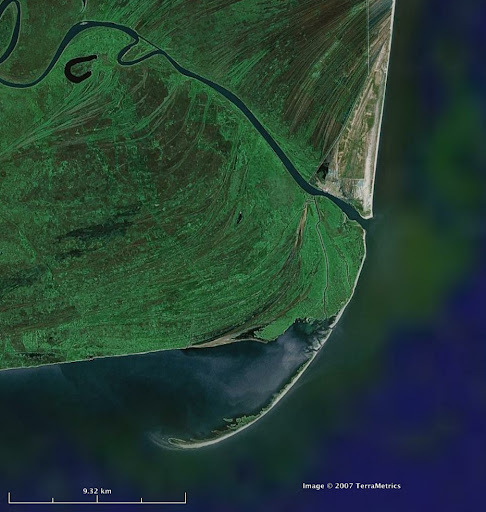 The northern side is being eroded (note truncated scroll bars) and being redeposited on the southern side of the river mouth (note spit). Brian – yesss, that’s the story I was thinking about. The paper I was referring to is “Wave-influenced deltas: geomorphological implications for facies reconstruction”, by Janok Bhattacharya and Liviu Giosan.Joe – Hungarians do tend to stick together… I guess. Although that’s not obvious if you look at Hungarian politics nowadays — but I don’t want to do that anyway.